See end for a revisions note. In a new blog post, Brad Wilcox and Nicholas Wolfinger ask, “are red or blue spouses happier?” Their answer — suspense — red. So, with all those controls, the “Republican advantage” remains. Liberal attitudes toward gender equality, sexual orientation and education all seem to foster stronger, more stable family lives. But Mr. Wilcox’s recent writings strike me as significant because they’re a reminder that conservatism also has values and cultural attitudes — about the importance of marriage and family life — that seem to improve the environment in which children grow up. Quite a conclusion to draw from a 3% net difference in a question on marital happiness — not exactly the best measure of “the environment in which children grow up.” But more importantly, I think it’s empirically wrong anyway. Lots of ways you could interpret this. 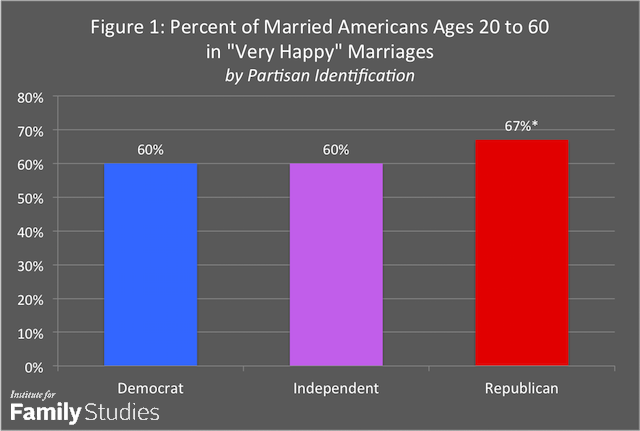 But I’m pretty sure the Wilcox and Wolfinger conclusion is not supported: “married Republicans are more likely than married Democrats to say they are in very happy marriages.” And the Leonhardt conclusion is just ridiculous (insofar as it’s based on these data). * What they don’t specify includes: Is the “Republican advantage” over everyone else, or just Democrats? how do they specify income (their are several GSS variables)? and, what do they do with “other party” respondents? I used a continuous measure of income (logged), and dropped the “other party” respondents. I replaced the weight variable WTSSALL with WTSSNR on the advice of Steve Morgan. This didn’t change anything substantial (though it narrowed the difference between strong Democrats and strong Republicans a tiny bit). I redrew the figures to get the red-blue thing right according to common usage. This is why I love Family Inequality. Well done! What is the correlation between party identification and religious attendance? Or better yet, Phil, let’s just look at marital happiness across the spectrum of religious attendance with the same model as above. What does that show? 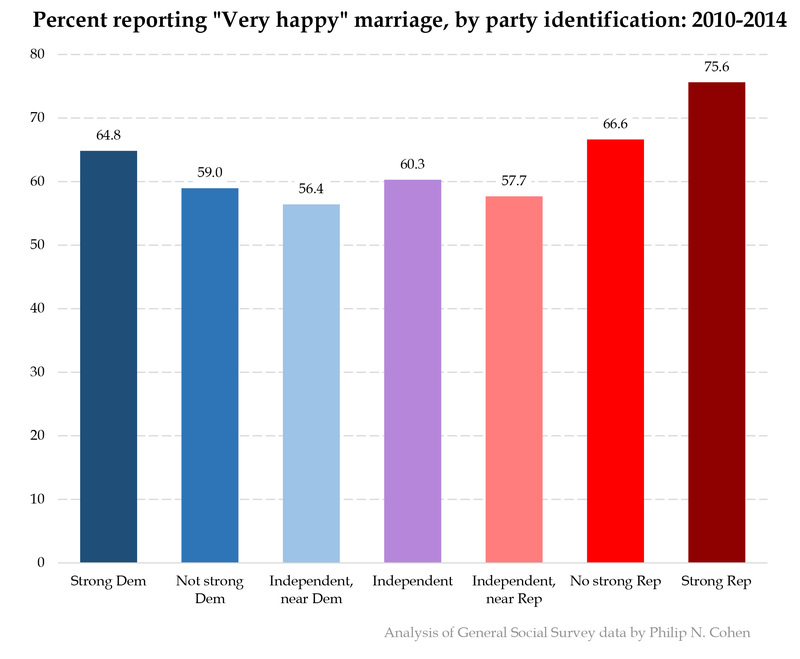 Is there any difference in one’s likelihood to indicate “very happy” in marriage if one attends religious services more or less frequently? Just curious. The variables are HAPMAR, PARTYID, and ATTEND. Apart from the criticisms you’ve outlined, isn’t a 3% difference (after the various control factors) within the margin of error for the study, making it statistically meaningless? Maybe all the difference it’s in old couples and you just cut them out censoring at 60! my bad, i skipped the part where they did the same. It was an ironic comment anyway. I was wondering about the old people. Thank you! 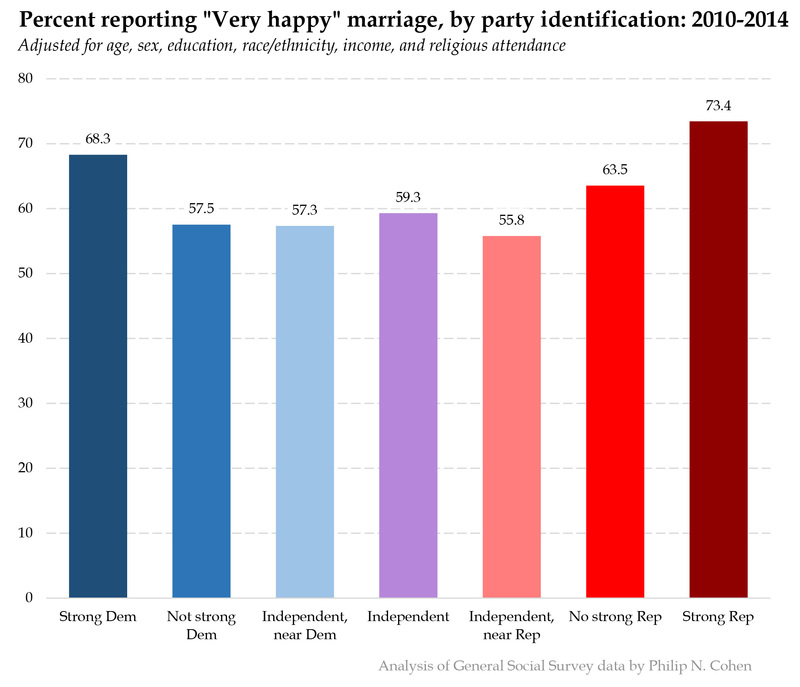 Does the GSS tell what fraction of Dems or Reps are married? What’s the sample size? Error bars please. 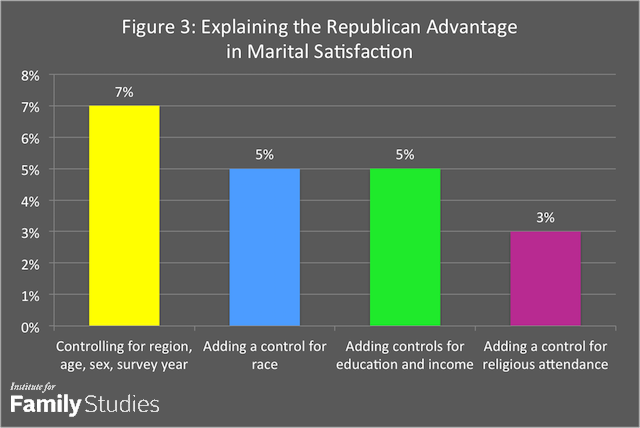 I would also point out, perhaps obviously, that in a strongly Republican-identified culture that promotes heteronormative marriage as a path to success and personal happiness, self-reporting that you were “very happy” in your marriage would probably be more likely … while those who identify with a culture more comfortable with family diversity might feel able to be less rose-colored lenses about their marriage experience. Yes, that was my first thought. Systematic bias in response. But the point is–this difference doesn’t even exist! So.